While the South was enjoying some recent battlefield successes in Virginia during the American Civil War (1861–1865), Confederate Gen. Robert E. Lee would send Brig. Gen. Robert F. Hoke to North Carolina during April 1864 in a grand attempt to recapture strategic Southern forts and ports along the coast. Although the Operations Against Plymouth (April–May 1864) were successful, exigencies of war would soon require Hoke to abandon all military activities and return to Lee's Army of Northern Virginia. The removal of Hoke's force and the destruction of the Confederate Ironclad ram Albemarle allowed both Plymouth and Washington, North Carolina, to fall back into Union hands. Confederate Brig. Gen. Robert F. Hoke, commanding, led the Operations Against Plymouth. Hoke, a North Carolina native, resumed command of his brigade at Petersburg, Virginia, in January 1864, and led it south to North Carolina, where he organized attacks on the coastal towns of New Bern and Plymouth. In the latter engagement during the Battle of Plymouth, April 17, 1864–April 20, 1864, Hoke captured a garrison of 2,834 Union soldiers. For his successes, the Confederate Congress would vote on May 17 to extend its "Thanks" for the action of Hoke and his men at Plymouth. Hoke would be promoted to major general on April 23, 1864 (appointment dated from April 20), and assume command of what was known as Hoke's Division in the Department of North Carolina and Southern Virginia. On May 5, 1864, the CSS Albemarle and a few Confederate vessels fought the Union Navy to a draw during the Battle of Albemarle Sound. The Albemarle was damaged and, unable to render further assistance, was scuttled before falling into Union hands. Although touted a Confederate victory, the Operations Against Plymouth were indeed short-lived because Plymouth would return to Federal control soon after Hoke was ordered to return with his forces to Virginia and assist Gen. Lee as he endeavored to enlarge his army and defend the state against the Elephant now under the command of Lt. Gen. U.S. Grant. For the duration of the conflict, the entire North Carolina coast would remain under Union control. During the spring of 1864 the Confederate authorities decided on a bold campaign that was designed to capture some of the towns held by the Federals in eastern North Carolina. Brig. 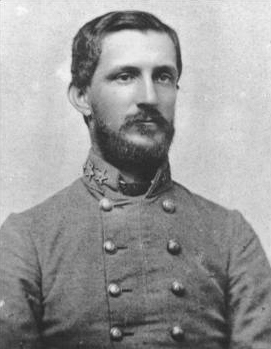 Gen. Robert F. Hoke, well-known for his brilliant battlefield successes, was selected to command the expedition. Along with his own brigade, Hoke also commanded Ransom's, Terry's Virginia brigade, the Forty-third North Carolina Regiment, of which the distinguished citizen, Thomas S. Kenan, was colonel, and several batteries of artillery, assisted by CSS ram Albemarle operating in the Roanoke River. Consisting of the Battle of Plymouth and Battle of Albemarle Sound, the Operations Against Plymouth (April–May 1864) was a joint Confederate Army-Navy effort to recapture vital Southern forts and ports along the North Carolina coast in 1864 during the American Civil War (1861–1865). In a joint operation with the ironclad ram CSS Albemarle, four Confederate brigades under Brig. Gen. Robert F. Hoke attacked the Federal garrison at Plymouth, North Carolina, April 17–20, 1864. On April 19, the Rebel ram appeared in the river, sinking the USS Southfield, damaging the USS Miami, and driving off several other Union Navy ships supporting the Plymouth garrison. Confederate forces next captured Fort Comfort, driving defenders into Fort Williams. The garrison capitulated on April 20, 1864. The Confederate victory at the battle of Plymouth added immense ordnance stores to the Southern war effort and reopened the Roanoke River for Confederate commerce and military operations. Brig. Gen. Hoke, in an after battle report dated April 20 to Confederate authorities, stated to have stormed and captured this place [Plymouth], capturing 1 brigadier, 1600 men, stores, and 25 pieces of artillery. * Next, Hoke intended to follow-up his victory by mounting an attack on the nearby strategic coastal community of New Bern (spelled New Berne at the time). Following the capture of the Union command and the newly acquired provisions at Plymouth, Gen. PGT Beauregard conveyed a rather sober truth about the recent fight. The general wrote that on April, 23, 1864, while at Weldon, N.C., I assumed command of the Department of North Carolina and Southern Virginia. It included Virginia south to the James and Appomattox, and all that portion of, North Carolina east of the mountains. The War Department was closely engaged at that time with certain operations against Plymouth and New Berne, from which great results were expected at Richmond, but about which the enemy was not much concerned, as the main object of his campaign could in no wise be affected or seriously disturbed by such a diversion. 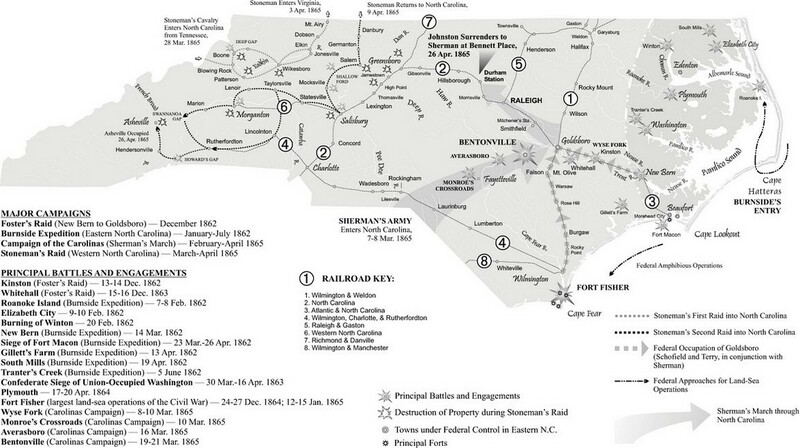 The fall of Plymouth led to the Federal evacuation of nearby Washington, N.C., on April, 28, 1864. (See also Siege of Washington.) On the evacuation, reported Union Gen. Palmer, Washington was burned by Federal troops. In an order condemning the atrocities by his troops, Palmer said, "It is well known that the army vandals did not even respect the charitable institutions, but bursting open doors of the Masonic and Odd Fellows' lodge, pillaged them both and hawked about the streets the regalia and jewels. And this, too, by United States troops! It is well known that both public and private stores were entered and plundered, and that devastation and destruction ruled the hour." Official Records, XXXIII, p. 310. 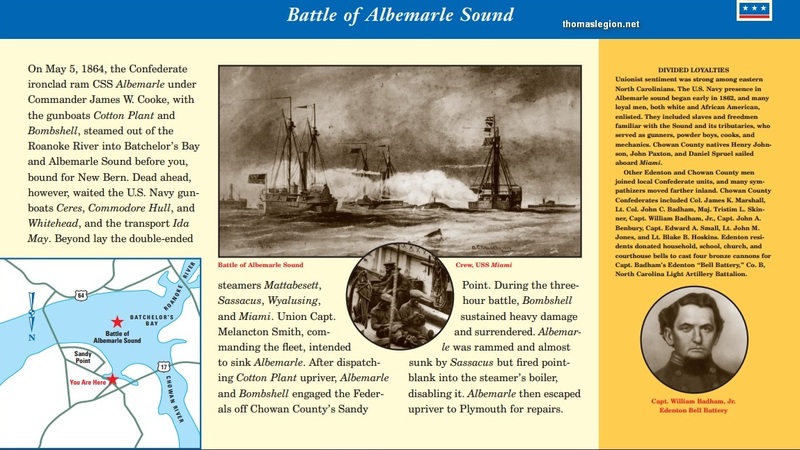 The CSS Albemarle sailed from Plymouth and engaged the Union fleet on May 5, 1864, and, due to the damage sustained in the battle of Albemarle, was forced to abandon its objective of New Bern and thus returned to Plymouth. Unlike most Civil War ironclads and rams, which were built in the traditional shipyard, the CSS Albemarle had been constructed in a Southern cornfield. While engaged during the Battle of Albemarle Sound, May 5, the Albemarle and her two guns had faced and engaged a large Union fleet that was armed with a total of sixty guns. The outcome of the naval contest, however, was the immediate withdrawal of Confederate and Union naval forces, therefore resulting in a draw. General Hoke next moved against New Bern. Although Hoke had already taken the outworks at New Bern and demanded its surrender, a messenger from Richmond arrived and hand delivered him special orders. Hoke had been instructed to report immediately to Petersburg, no matter how far his operations might have advanced against New Bern. According to Official Records, "No time was lost in carrying out the order." The anticipated Union attack on the Confederate capital of Richmond had warranted Hoke's immediate assistance. His withdraw and advance was to be "made with all haste," stated General Robert E. Lee, who had received his instructions directly from President Jefferson Davis. *D. H. Hill, Jr., Confederate Military History Of North Carolina: North Carolina In The Civil War, 1861-1865, page 174, stated the number at "nearly 3,000 men and 25 pieces of artillery," which would be the entire Federal garrison. Hoke's preliminary report, dated April 20, 1864, is often quoted by many authors and historians, but, since the entire garrison had surrendered, less casualties, the number of "nearly [less] 3,000" would reflect the after battle report. On p. 193, furthermore, Hill, quoting Colonel Henry Burgwyn of the 26th North Carolina, stated, "Capturing Plymouth...with some [at least] 2,500 prisoners." Whereas both Confederate and Union reports and records placed the Union total between 2,500 and 3,000, according to p. 618, Histories of the Several Regiments and Battalions from North Carolina in the Great War 1861-'65 (Volume 2), Brig. Gen. Wessells reported Union losses of exactly 2,834. John Barrett presents the complete story of military engagements across the state, including the classical pitched battle of Bentonville--involving Generals Joe Johnston and William Sherman--the siege of Fort Fisher, the amphibious campaigns on the coast, and cavalry sweeps such as General George Stoneman's Raid. Since very few books have been written on this subject, this volume provides a fascinating and vital portrayal of the one of the most important conflicts in United States history. Naval Battles of the Civil War is lavishly illustrated with rare contemporary photographs, detailed artworks, and explanatory maps, and the text is a wonderful blend of technical information, fast-flowing narrative, and informed commentary. Try the Search Engine for Related Studies: Operations Against Plymouth North Carolina, American Civil War Battle of Plymouth, Battle of Albemarle Sound History, Pictures, Details, Union, Confederate Ships, Vessels, Ironclads, CSS Albemarle Details, Facts.